Held in Las Vegas in early January, the 2014 International CES exposed spectators and competitors to Ford’s latest hybrid car. This machine is setting the stage for revolutionizing the green-energy industry in cars—with special thanks to the help of one Tech professor and his lab. Unlike current hybrid-electric models, the new car, the C-MAX Solar Energi Concept, has built-in solar panels that can take energy from the sun’s rays directly to convert to energy for the car’s later use. 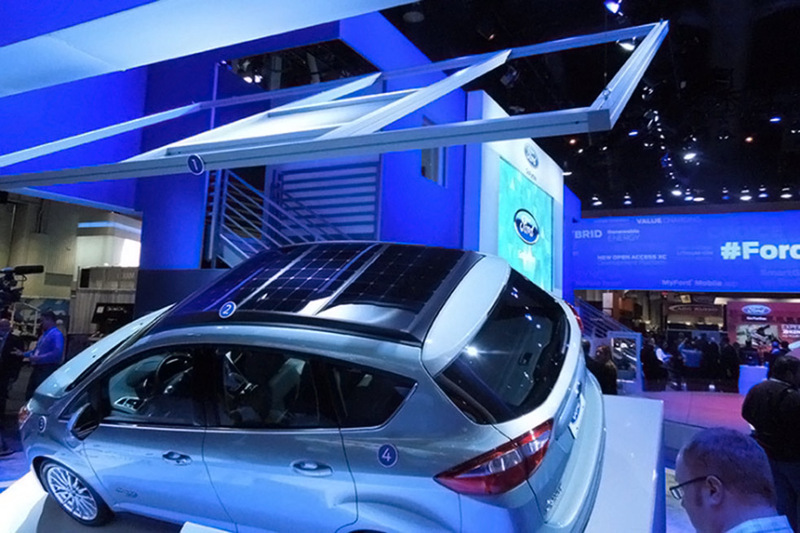 Both Ford and SunPower developed the car’s panels. Ford then called Dr. Bert Bras, a professor in the school of Mechanical Engineering, and his lab to seek out a better way to concentrate sun rays in an effort to maximize the absorption of light. The system has the ability to take in an up-to-eight-kilowatt-hour battery charge, if placed in sunlight for a day. This would not be enough to charge the car’s battery, however; this is where Bras’ lab came in handy, developing a magnifying glass-like contraption that better harnesses the power of the sun. It also improves the energy absorbed by a factor of eight. With that kind of a charge, a person could drive at least 20 miles before any gas begins to be consumed. One Ford representative at the CES convention explained to the DailyFinance that simply harnessing the sun’s rays rather than using the current plug-in method could save a consumer roughly $500 to $600, depending on the cost of electricity where the consumer is situated. Either way, Bras’ team devised a simple solution that provides the consumer savings. In addition to the direct savings, as the Georgia Tech Research News reports, the car would be powered by the sun for nearly 75 percent of trips, in terms of the trips made by an average driver. Though the car still contains a fuel-engine system, the latest Ford model adds another layer of separation between the conventional fuel-model and a completely independent and green system. Ford’s model comes against Toyota’s counterpart, which used a fuel cell to power the vehicle. The green transportation system seems to be taking off in all directions with consumer’s options on the rise. “Whether it’s fuel cell, whether it’s a solar energy car, whether it’s pure electric, I think there’s going to be a spectrum… especially with public consciousness growing every single year about some of the different choices that they might have in coming years,” said a Ford representative.